I have just published my latest scenario for Flintloque 3rd edition over on the Alternative Armies blog. Go along to the post to download it. A fun solo play rather odd link in the Escape the Dark Czar chain all about trying to avoid Zombies as they come to life randomly in a field of snow..will you make it across? 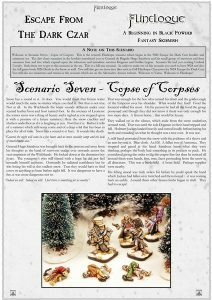 This scenario was playtested the usual three times and I was delighted with my own time taken to write it which was about four hours all in including the formatting (I prefer to format my own work if I can to do last minute edits). I hope you enjoy it. This entry was posted in Gaming Concepts, Wargaming Hobby and tagged Flintloque, Wargaming, WIP by Gavin Syme. Bookmark the permalink.